hungry shark evolution is a game based around the survival and growth of your shark. As a shark, you must eat in order to survive, while at the same time you will grow from a baby shark into a hulking great white that is the fear of all-else in the ocean. 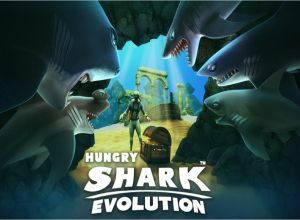 Developed by Future Games of London, Hungry Shark Evolution is one of the best looking mobile games, featuring varied levels, food-types and gameplay mechanics. This guide contains information about the gameplay mechanics, leveling up, shark types, shop, maps and hints and tips that you may need to help progress at the game. How do you get the special sharks without getting a hiscore of 500000? Pls answer. Does anyone here know where the shells for the mososaurus are? How do I buy things from the shop? 33Can We Get A New Message Alert?